Wow, so it's really come to this. Customers are waiting so long for their shiny new Kindles to show up that they're offering advice on how best to spend the time between order placement and device receipt? Yep, it's true. Check out this post on the Kindle forum and you'll see five great recommendations from one very patient Amazon customer. Here's a fun article on The Motley Fool in which writer Rick Aristotle Munarriz speculates on what Amazon will look like in the year 2010. I love the vision he has for the next couple of generations of the Kindle (e.g., touchscreen, fits in your pocket, listen to music/audio books, watch videos, etc.) I can't wait for Kindle 2010! Microsoft Senior Program Manager and Wiley author Scott Hanselman is a former Sony Reader user who is now a Kindle convert. In this blog post Scott covers everything he loves about his new Kindle. He's so right about the one reason the Kindle exists: "To extract money from my wallet." I find it interesting that Scott has grown tired of his iPod and leans more towards XM Radio, particularly since I'm heading in the opposite direction. I've had XM for a couple of years now and find that the old cable line is true: There are 500 channels and nothing is on! (Or in the case of XM, only about 170 channels.) I recently bought an 80-gig Zune and am rapidly drifting away from XM Radio. I'd rather use randomize and the fast forward button to listen to what I want to, not what some satellite DJ wants to play. Be sure to read Scott's entire review of the Kindle; he covers the pros and cons quite effectively. Looking for a simple, free and effective way of following your favorite RSS feeds on your Kindle? Michael Puhala has just what you're looking for over on his Interface blog. He uses this post to talk about a free service called FeedJournal which lets you convert RSS feeds to PDF files, suitable for printing. Rather than printing them though, Michael e-mailed the file to his Kindle. Pretty cool! Earlier this month Jim LaRoche of HTMPublishing used his BlogBook tool to convert the archives of my Publishing 2020 blog into a trio of Kindle downloads. 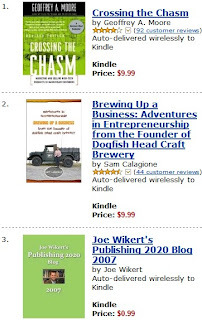 I stop by the archive product pages on Amazon from time to time and today I noticed something odd: My 2007 archive is currently #3 on the Kindle list of New Business Enterprises titles (note that the list will probably change by the time you click that link, which is why I captured the screen and included it in this post). OK, sure, that's a pretty narrow shelf definition, but #3?! And only two slots behind Crossing the Chasm?! If that isn't odd enough, the same archive is also #9 on the Technology list, one slot ahead of Electronic Projects For Dummies. So is this archive file a runaway bestseller? Of course not. Unfortunately, I'm pretty sure this is just another sign of the very small number of Kindles currently in use today, which probably means you only have to sell 2 or 3 copies of a product to appear on one of these lists. Technology Review, a magazine from the folks at MIT, recently published this short summary article about the Kindle. It features a photo of a disassembled Kindle and offers a nice visual reference for all the key components. Much of this information came from the folks at RapidRepair who posted these Kindle disassembly instructions shortly after the device was introduced. The [lab]oratory blog has an interesting take on this Kindle article in The Washington Times. The Times reporter seems to have a problem with the fact that Amazon would sell public domain content for the Kindle. I'm guessing the reporter hasn't visited one of the larger brick-and-mortar chains to see that they too sell copies of books based on public domain content. So what? If someone decides Amazon or the brick-and-mortar chain is charging too much, well, they could just go ahead and sell the exact same public domain content themselves! Good luck though. Most of the times I've seen these private label literary classics in the store they're dirt cheap already. Back to the Kindle... Even though Amazon has a lock on Kindle content that can be seamlessly downloaded via Whispernet today, I'm intrigued by what at least one other content provider is up to. Actually, this other provider hasn't launched yet but they did put out this press release a few days ago. The company is called Smashwords and if you read that press release you'll see they've got a very interesting e-content model, both for authors and consumers. If you read it closely you'll see they plan to support a variety of file formats, all without DRM, including .mobi. This could be a great opportunity for Kindle owners since it would give them an alternate content source; although it wouldn't load via Whispernet it would be a simple drag-and-drop operation with the Kindle's USB cable. For more information see this post on my Publishing 2020 blog. After that initial wave of publicity it's clear Kindle news has really slowed down over the past several weeks. The lack of buzz is no doubt partially a function of Amazon's out-of-stock situation, a problem that's literally existed since day one. (c) a little bit of both? Earlier today I posted about a series of PDF archive files Jim LaRoche is building from my Publishing 2020 blog. The 2007 archive is available as a PDF file here, but the even more exciting news is that it's also now offered as a 99-cent download for the Kindle. How cool is that?! I searched high and low and couldn't find any other blog archives for sale on the Kindle platform, so I'm pretty sure this is a publishing first. Thanks to Jim LaRoche for not only building the archive but for suggesting the Kindle idea. If you're looking for a great blog-to-book solution, be sure to check out his service. Jim is currently working on the 2005 and 2006 archives, which will also be made available as free PDFs and 99-cent Kindle downloads. Here's an interesting opportunity the Kindle offers: Stephen Windwalker, author of the forthcoming book entitled The Amazing Amazon Kindle, is selling a 2,200-word excerpt called How to Use the Amazon Kindle for Email and Other Cool Tricks. In fact, the excerpt is currently #4 in the Kindle Store! Windwalker's book and excerpt are obviously playing to a very captive audience on the Kindle, but it makes you wonder if there are other opportunities where something beyond a traditional sample chapter could be sold online for a modest price ($2.49, in this case). Btw, it reminds me of a time back in 1984 when I bought one of the first original Macs. (Why did 128K of RAM seem like more than you'd need in a lifetime back then?) After plunking down $2,500 for the base unit (at Graham's Computer, long since out of business) I couldn't resist forking over another $500 for a state-of-the-art dot matrix printer. One of the first add-ons I found was a Mac carrying case. I'm pretty sure it set me back another $150. I still have all of this in my basement and keep threatening to turn the Mac itself into an aquarium, a MacQuarium, if you will. I deliberately waited a few days before mentioning this post on the Engadget blog. They're asking you to tell Jeff Bezos and the rest of Amazon what you'd like to see changed/added/fixed in Kindle version 2.0. I wanted to give the post some time to gather comments and see what the suggestions look like. Now that the original post is a few days old you'll find there are well over 100 comments on it. Unfortunately, other than the periodic "I hate e-books and I wish the Kindle would go away" rants, most people are asking for more functionality at a much lower price. Pretty typical for a first generation gadget. If you've been looking for a way to voice your thoughts on Kindle improvements, you'd be hard-pressed to find a better platform than Engadget. Go ahead, add to the comment list with your own great perspective. Who knows. Maybe your idea will find its way into Kindle 2.0. Granted, my list is more focused on content services and not the hardware itself, but I still think these are all worthy of consideration. Kindleville is less than two months old though, so I'm hoping to come up with bigger/better ideas down the road! How about a service that allows you to seamlessly switch from reading a book on your digital device to listening to the same book read aloud as you get in the car, or if your eyes are tired, or if you simply want to hear a crucial scene acted out? And then to switch back to the printed page? How about audiobooks that you can easily transfer between your computer, e-book reader and cell phone? Or e-book downloads that come packaged with a discounted audio track? He goes on to say that "the real opportunity is to start bringing some excitement and flexibility into the hardback-bound world of book publishing –- and to get people reading again, even if their eyes never land on the printed page." I couldn't agree more. On a related note, I'm tying together some additional thoughts on e-content distribution/consumption on my Publishing 2020 blog, starting with this post.